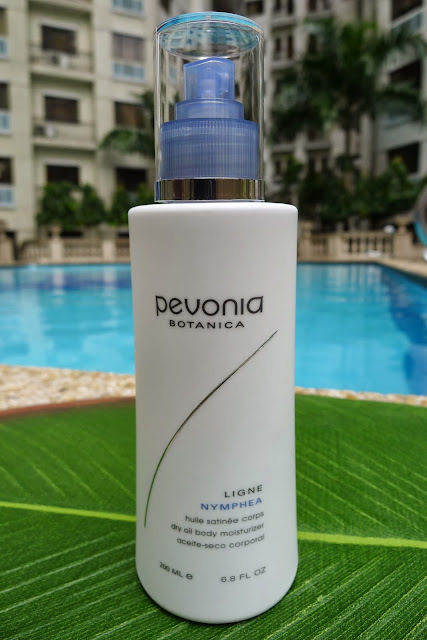 Let me tell you about a new beauty product that I have tried recently - It’s a dry oil moisturizer from elite spa brand, Pevonia! How does it work? After taking a shower, just spray the dry oil moisturizer all over your body and massage until it is absorbed. 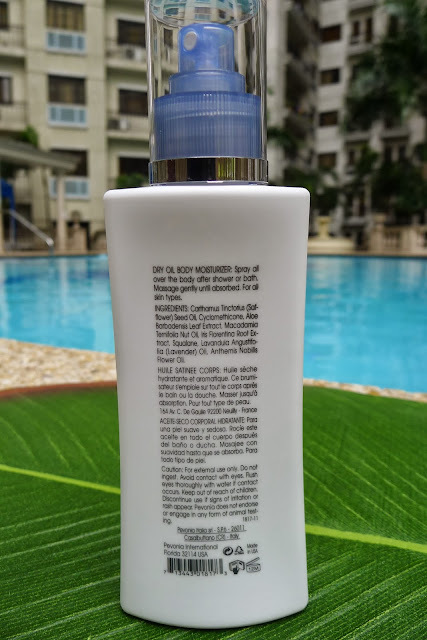 Unlike heavy and creamy lotions that usually just sit on your skin and take forever to absorb, the dry oil moisturizer is quick absorbing, non-greasy and reveals a matte finish that leaves skin soft and smooth. Pevonia’s dry oil moisturizer is also floral scented. When I first tried this product, Mickey commented that it smelled good on me. I love its fresh, clean scent and the fact that I can use this product and not wear any other fragrance on a casual day. 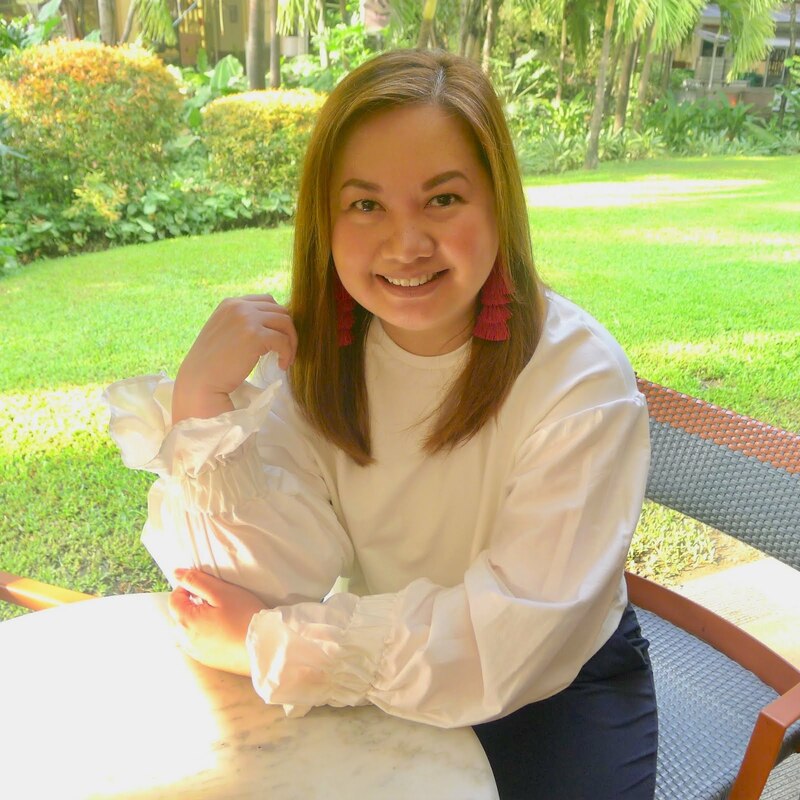 Before sleeping at night, this product is also a dream to use, I can jump into bed without having to worry that it will leave oily stains on the sheets! With the weather getting a bit colder this Christmas season (and even during the summer months when it's very dry), the dry oil moisturizer provides nourishment for dry skin caused by sudden weather changes or even extreme weather conditions. Pevonia's dry oil moisturizer would be a great gift to give to the women in your life and most especially for yourself! A 200ml bottle costs PHP 3,250.00. You can get one from their website at www.pevonia.com.ph or you can also grab a bottle after treatments from any of the Pevonia partner Spa's nationwide. Click here to find the nearest Pevonia partner Spa near you!